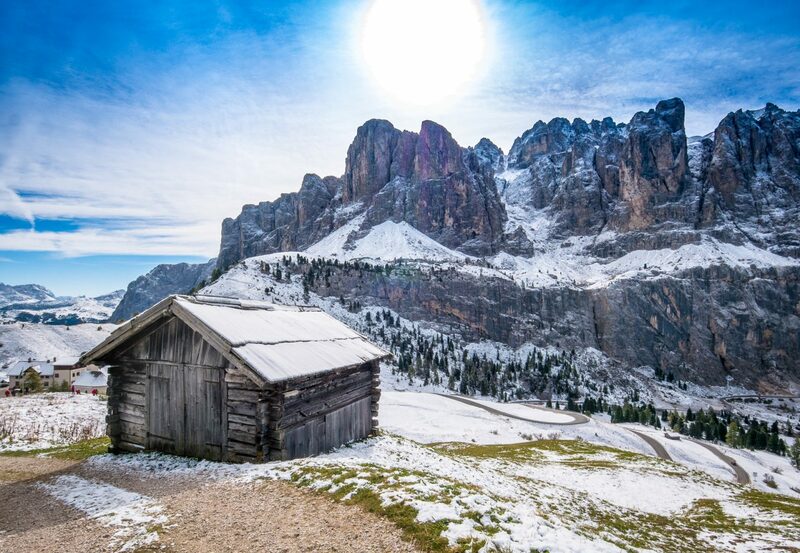 Most people head to the Dolomites – that craggy region of northern Italy – to hike amid its jagged peaks in the summer or to ski in winter. But throughout the region lie many charming towns and villages that deserve a closer look. 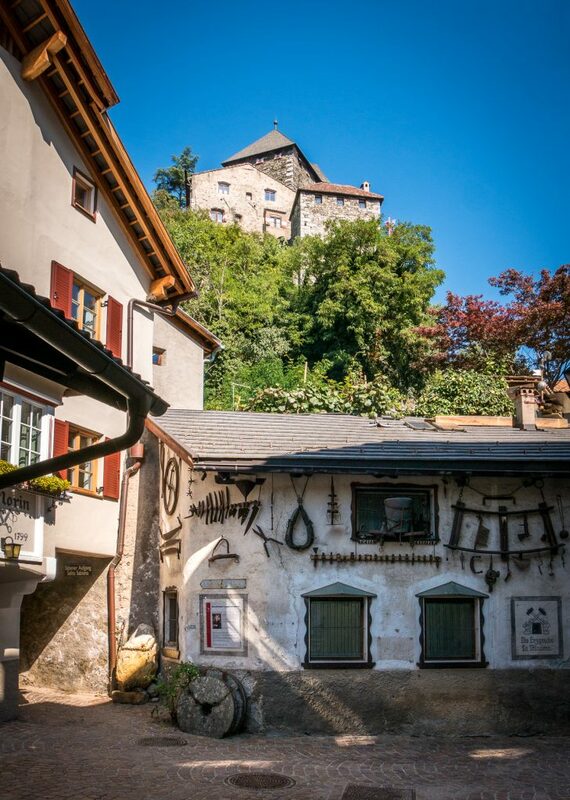 One such place is the small artists’ town of Chiusa (Klausen in German). In much of this area known as South Tyrol, more people speak German than Italian since prior to WWI, this region was part of the Austro-Hungarian empire. 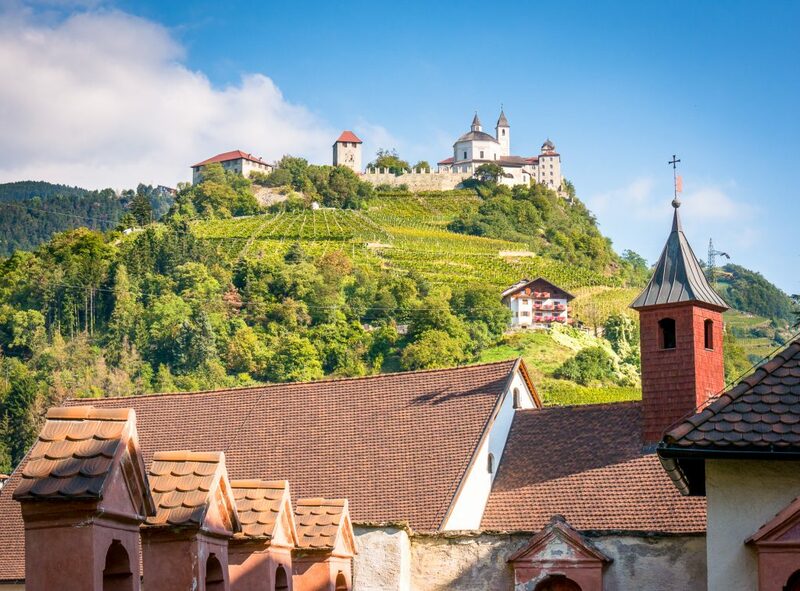 Chiusa lies about 18 km (12 miles) north of the larger city of Bolzano, or 60 km (40 miles) south of the Austrian border. But this combination of Italian and Germanic influences gives Chiusa its distinct character. 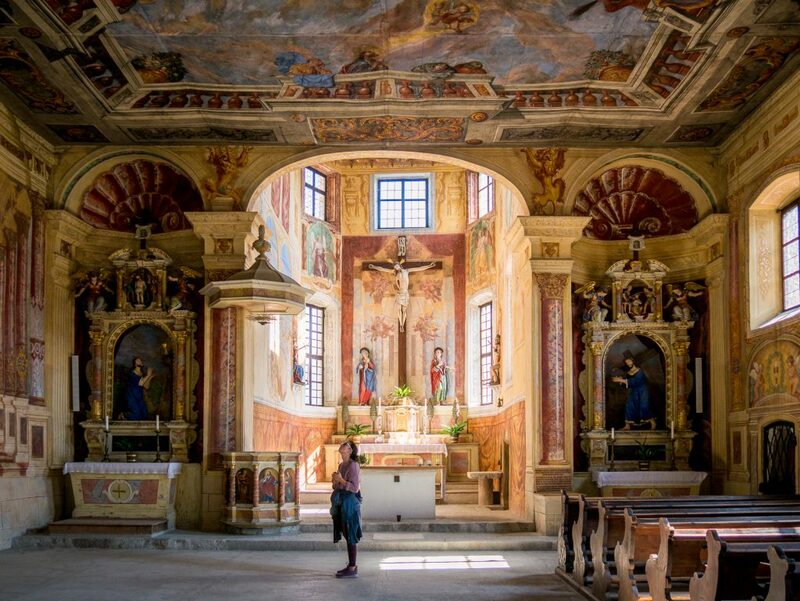 You may never have heard of it before and you could cover the highlights of Chiusa on a short visit as you’re passing through the region (it’s conveniently right off of the autostrada. You can see an elevated section of the freeway to the rear of the photo above). But spend a bit more time to linger and wander and the wonders of this lovely town begin to reveal themselves. 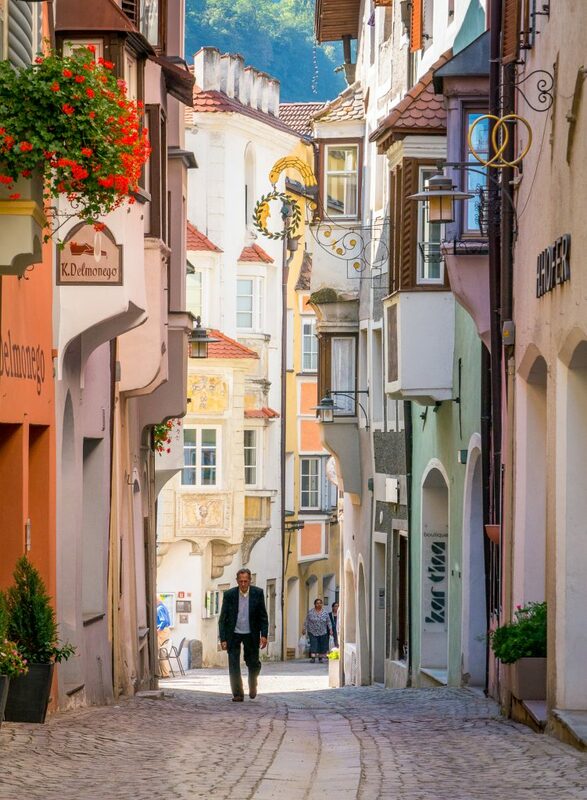 As you enter town, look for the signs to the “Altstadt” (old city in German) or city center. Just driving through on the main road will leave you wondering about those castle-looking buildings on the hill, but otherwise underwhelmed. You have to make your way to the small central area and begin exploring to discover the full beauty of this place. If you arrive on a Sunday, as we did, you’ll find most of the shops closed. But you can still enjoy a meal at one of the restaurants or cafes that line the town square. 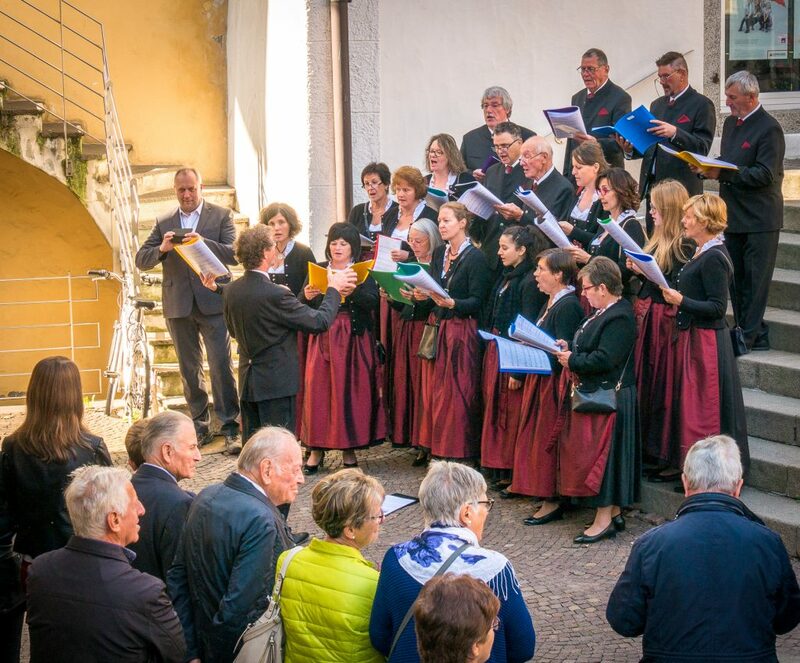 You may be fortunate enough, as we were, to come upon a wedding outside the town’s main church, the Chiesa di Sant’Andrea, where you’ll behold a choir in traditional garb sing a beautiful song a cappella to the attendees. On a weekday, if you like to shop, you’ll find a wealth of intriguing boutiques and quaint stores along the main street selling handmade wares and locally crafted gifts. Chiusa has always been a town that attracted creative types, especially poets and artists such as Albrect Duerer who is said to have visited and sketched the city in 1494. The town invites exploration so after strolling along the main streets, wend your way through narrow passages, eventually ascending a set of stone steps that mark the start of the Via Cruxis, the Way of the Cross, up the hillside behind the town. Along the way you’ll pass by works of religious art set in small shrines that mark the way, and mostly, fields of grapes. Vineyards line many of the surrounding hills. Visit in the fall and you’ll see plump clusters of grapes dangling in the sun along the entire route. The small castle seen from below, Branzoll Castle, is privately owned (nice digs) and thus not open to the public. So continue up the hill, stopping frequently to take in views of Chiusa and the valley below you. Eventually you’ll approach the top of the rocky outcropping on which sits the Sabiona (or Saeben, in German) Monastery, one of the oldest pilgrimage sites in the region. A building of some kind has been on this site for over a thousand years. However, it wasn’t until the late 17th century that it became a Benedictine monastery. Shortly after that, it turned into a convent. A few nuns still reside there, but they stay mostly out of sight in private areas. That frees you to explore the first courtyard which contains a cistern with potable water above which stands a modern bronze relief. Pop into the chapel then, after paralleling the monastery walls, pass through a tunnel to arrive at multilevel courtyard area near the top. It’s easy to assume all the doors there are locked. Don’t. At the very top lies a foreboding black iron door. 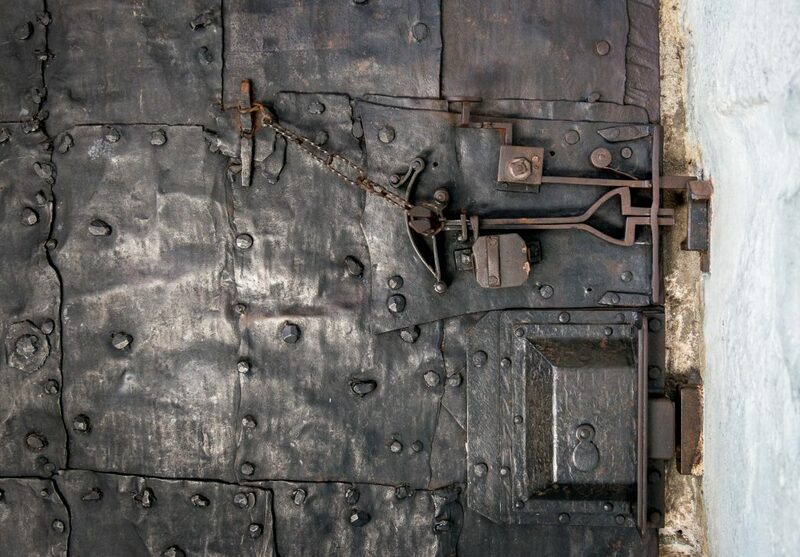 Open it and walk inside. 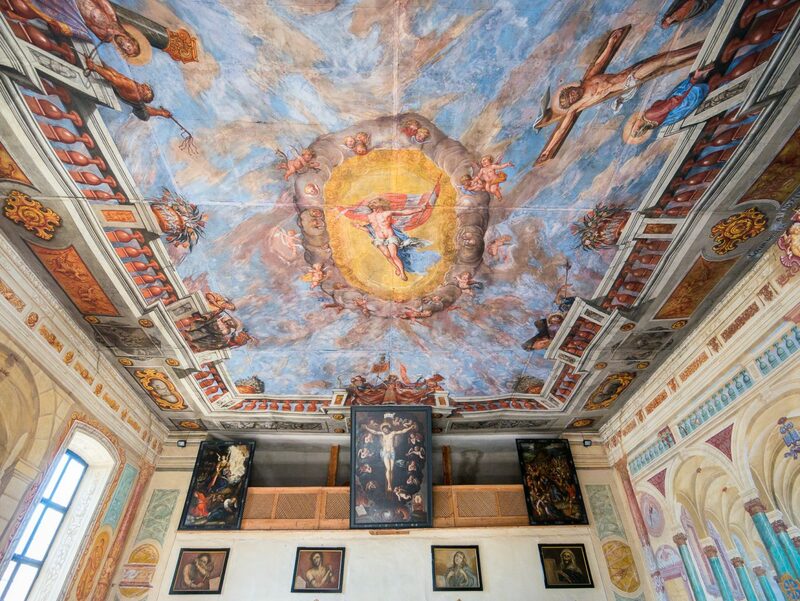 When you do, you’ll discover the largest of the four churches, the Church of the Holy Cross and its impressive frescoes. On a sunny afternoon, the interior fills with warm light and all the colors from the highly decorated walls and ceiling. You can spend a fair amount of time in the monastery just absorbing the quiet presence of the place. Contemplating beauty and the divine, however, can be parching work. 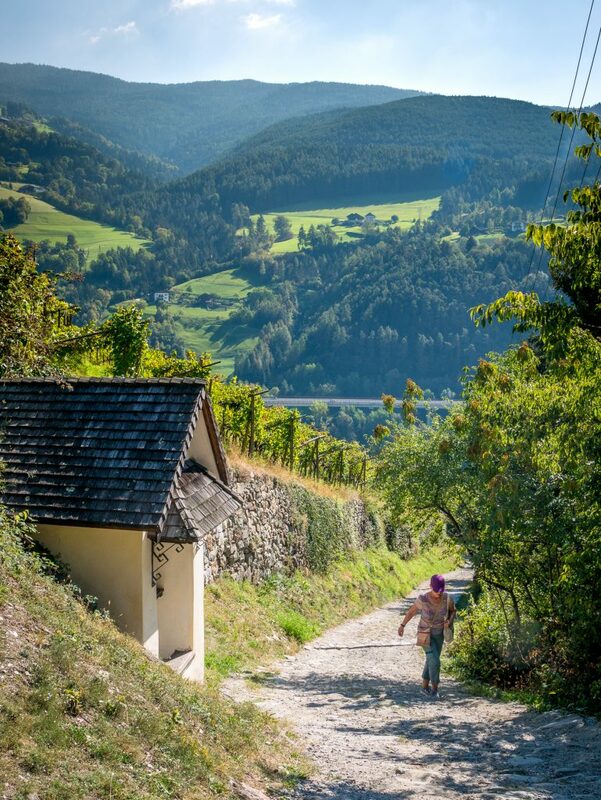 Thus, once you’ve explored the nooks and crannies of the monastery, head back down the hill and follow signs through a vine tunnel that lead to the Restaurant Pizzeria Torgglkeller. Pizzerias in this part of the world are as ubiquitous as fish and chips stands in the UK or poke places in Hawaii. If you don’t like pizza, your food options diminish significantly. 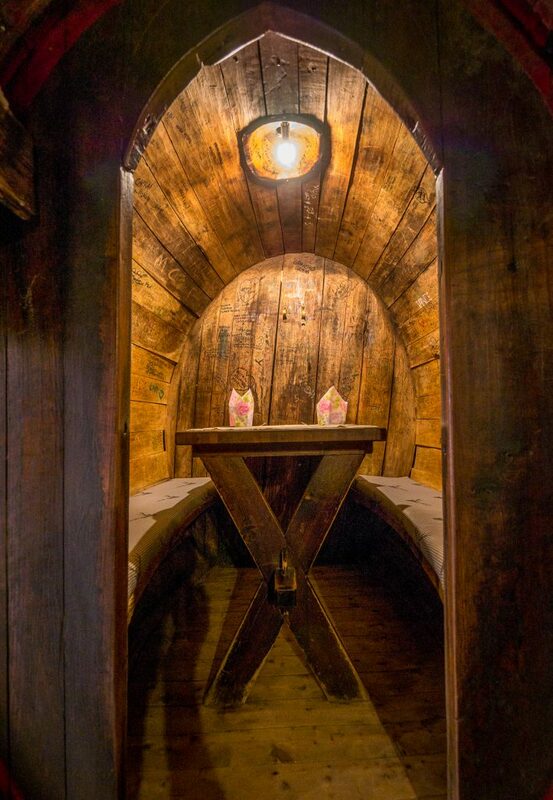 However, you can try your luck at other choices inside sitting in one of the old wooden barrels to dine (see photo below) or head outside for a beer or a light snack. After relaxing, you can head out to one of several nearby valleys for stunning views of the surrounding mountains. 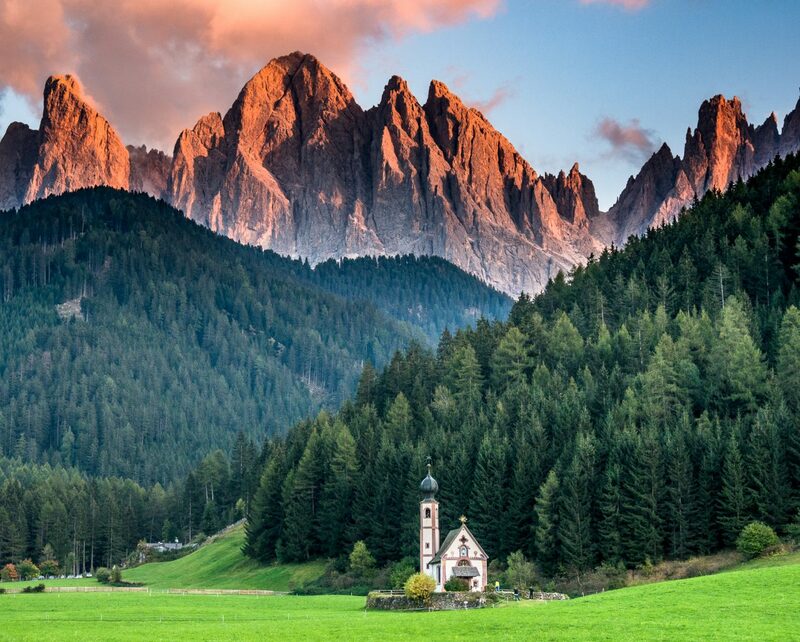 A close and popular option is to visit Val di Funes (Villnoess Valley) to capture a quintessential Dolomites image, that of the church of Santa Maddalena (St. Magdalena) with the Odle mountain range in the background near sunset. You can actually take a gondola (two, to be exact) up from nearby Ortisei to reach another often-photographed area of the Dolomites, Seceda, which sits at the top of this range. Each of these lies only about a half hour drive away from Chiusa. In short, Chiusa makes a fantastic base for venturing into some of the most gorgeous areas of the Dolomites. If you spend the night in Chiusa, you can dine at one of the many restaurants you walked by earlier. We had a surprisingly good dinner at Gassl Brau. You’ll recognize it for by the huge copper vats seen inside used for brewing their own beer. I had one of the best salads of our trip. Pizza I expected in northern Italy. Such a wonderfully fresh salad, no. It was just one of the many unexpected aspects of Chiusa. We were there for three nights and we wished we’d had more. 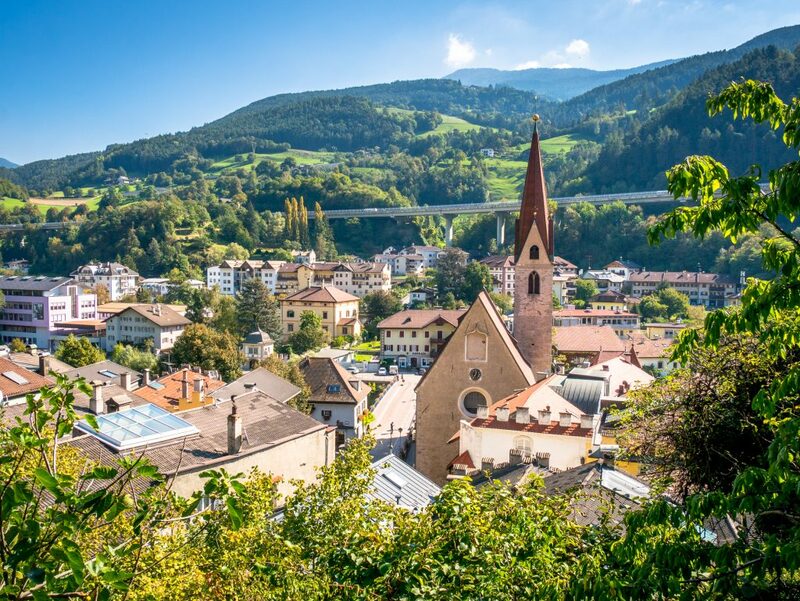 The best part is that other villages like neighboring Velturno (Feldthurns) and even the much larger city of Bressanone (Brixen, shown above) just north of there, all have their appeal. 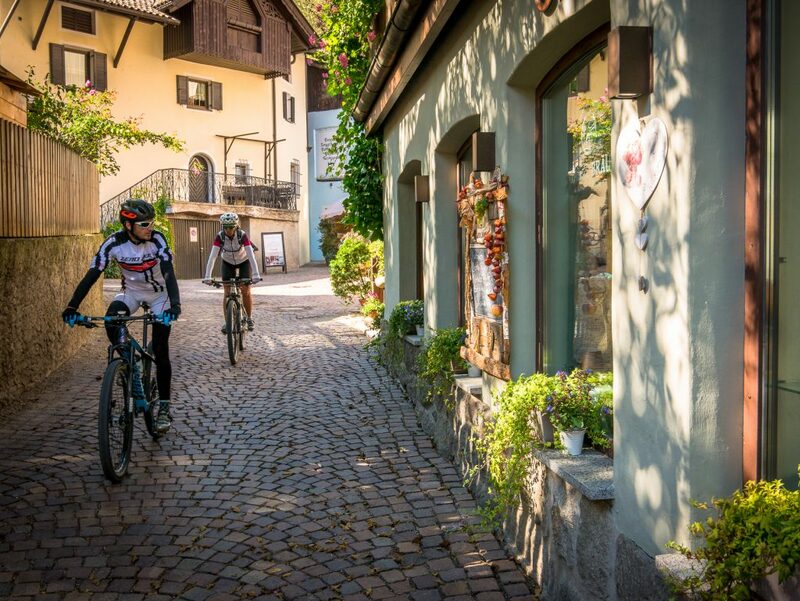 In short, a trip to the Dolomites doesn’t have to be just about the mountains and their trails. Visiting a small town like Chiusa allows you to have the best of all worlds: the adventure of mountain adventure along with the charm, comfort and romantic appeal of a beautiful European village. Adventurers will appreciate the hiking, skiing and discovery possibilities that abound in the surrounding mountains and valleys. 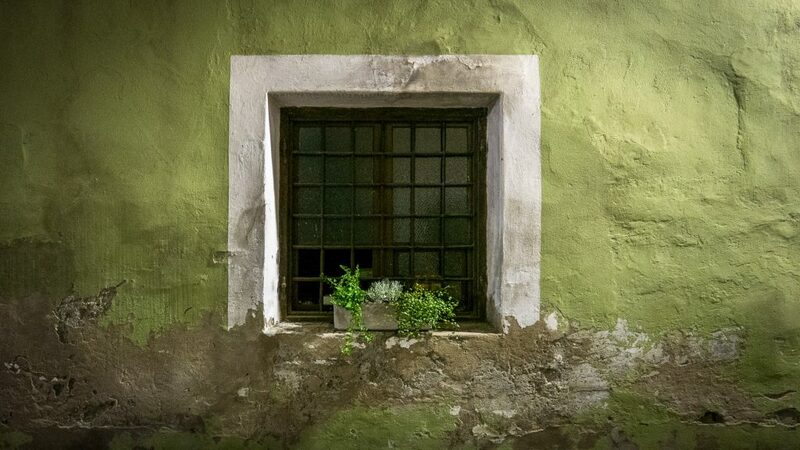 Creative Travelers will love that Chiusa is known as “The Artist’s Town.” It’s been inspiring creatives for centuries. 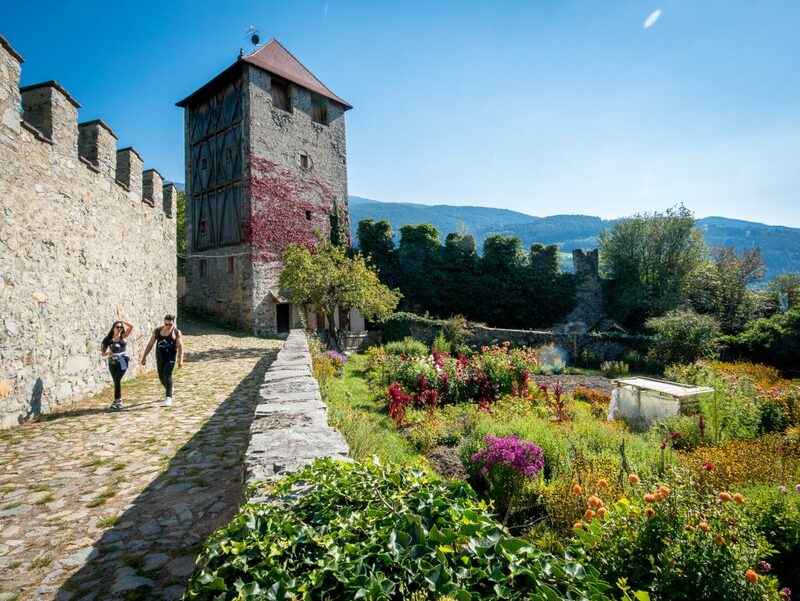 Learners can dive into the rich history of the place or take classes or guided tours that explore local crafts or traditions such as cheese or wine making. Connectors have the perfect backdrop for spending time at the charming cafes or getting to know the locals, many of whom speak good English. A few hours will suffice for the sights. But Chiusa makes an excellent base for a multi-day stay and allows a more leisurely appreciation of its charms. 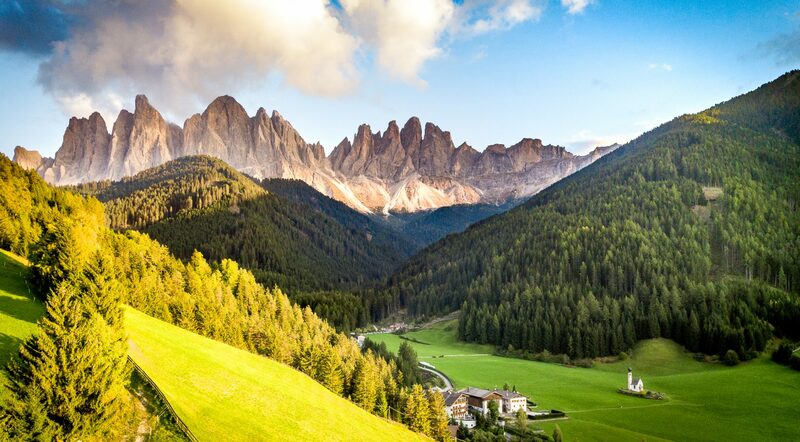 The Dolomites of Northern Italy are, to me, some of the most visually distinctive mountains in the world. The Himalayas are more extreme. The Andes longer. The Rockies higher. The central Alps of Switzerland, France, Austria (first cousins to the Dolomites which lay within the Southern Limestone Alps) are more famous. But the Dolomites can be just plain magical. The limestone of the Dolomites affects both their shape and color. The hard, chalky stone wears down over millennia in such a manner as to create the dramatic jagged rows of peaks that, in some areas look like the Bumble’s teeth on Rudolph the Red Nosed Reindeer, and in other places, like lofty cathedral spires, castle battlements or simply bizarre rock formations on a massive scale. 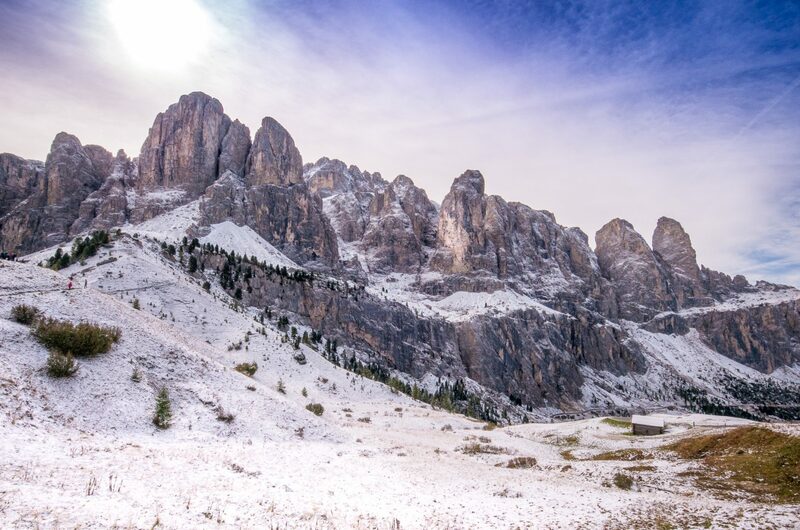 And the whiteness of the stone that gives the Dolomites its other name, “the Pale Mountains,” makes these peaks stand out at any time. But view them when the sun rises or sets and the mountains radiate Alpen glow colors ranging from soothing pink to purple to brilliant scarlet. Locally, they even have a name for it: “enrosadira” (from the Italian word, “rosa” for pink). The sharp, spiky nature of these mountains at first reminded me of Wyoming’s Grand Tetons. 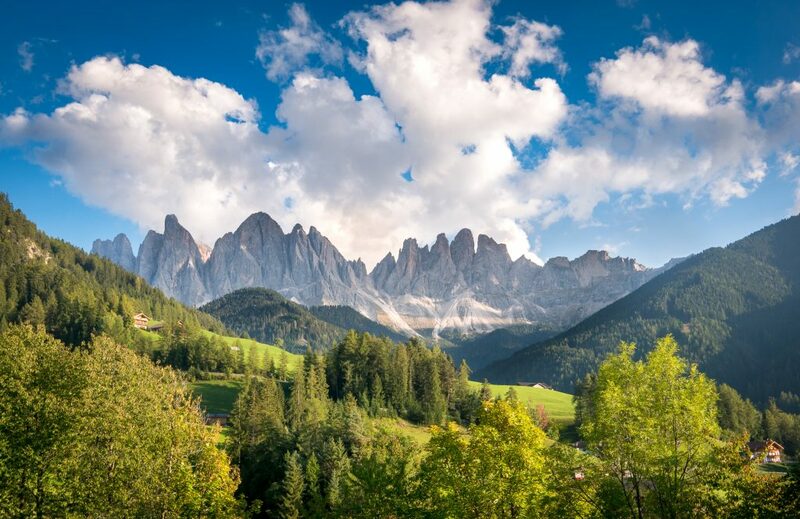 But the Dolomites’ appeal goes beyond the mountains themselves to include the lush green valleys, the quiet lakes and the tiny hamlets of surprising history and character that you find throughout the area. It’s a place I long to return to simply because every season will reveal a very different experience. 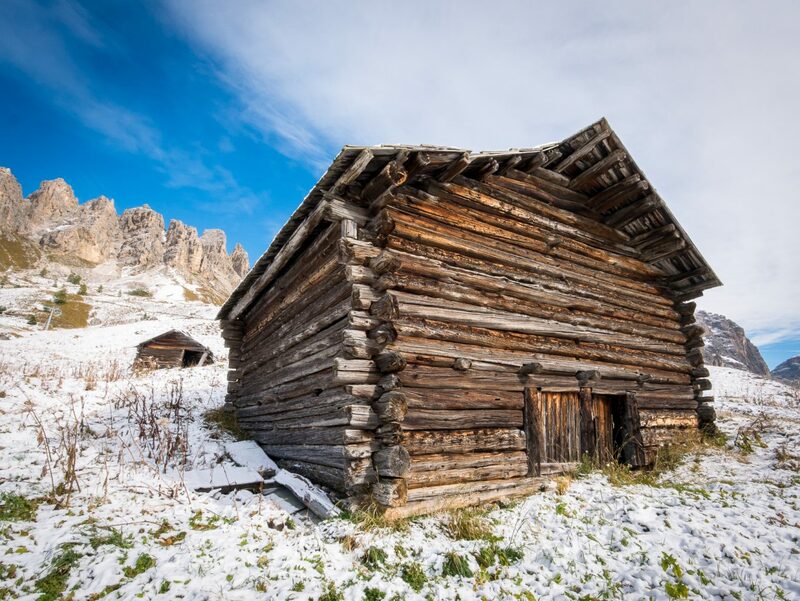 The various ranges that make up the Dolomites are part of an UNESCO World Heritage Site. In summer, many people come to hike, bike or climb. In winter, skiers throng the area enjoying the numerous downhill and cross-country runs. 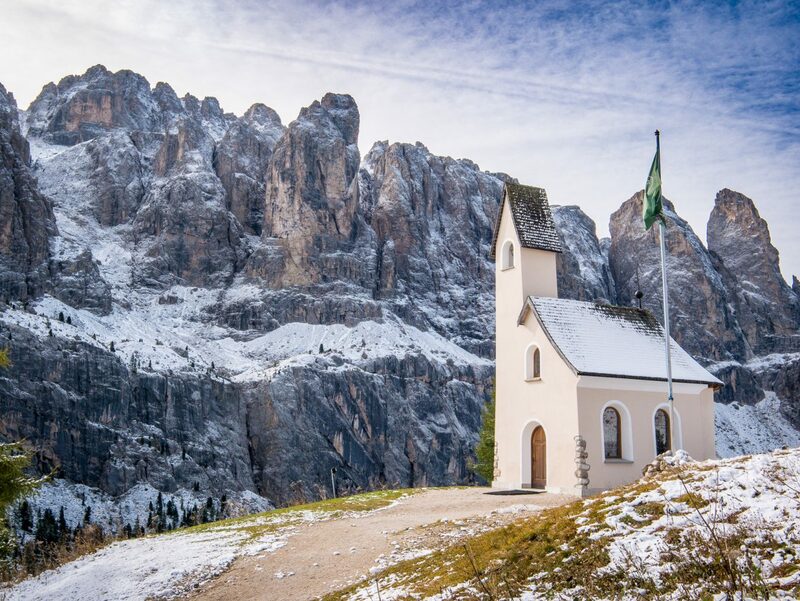 But if you visit the Dolomites in the shoulder seasons, spring or especially in early fall, you can enjoy their beauty without jostling others on the trails or getting stuck behind a dozen cars on the twisty mountain roads. 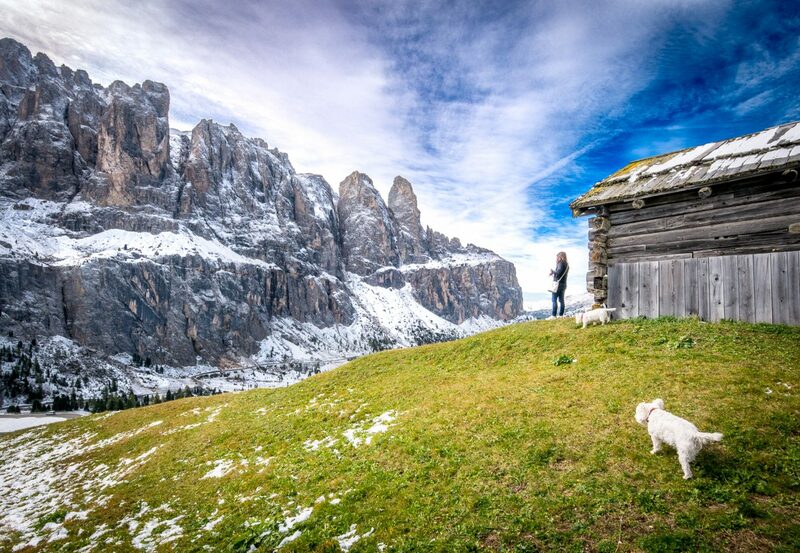 You can spend weeks, even months, exploring the Dolomites and still never see or experience all they have to offer. 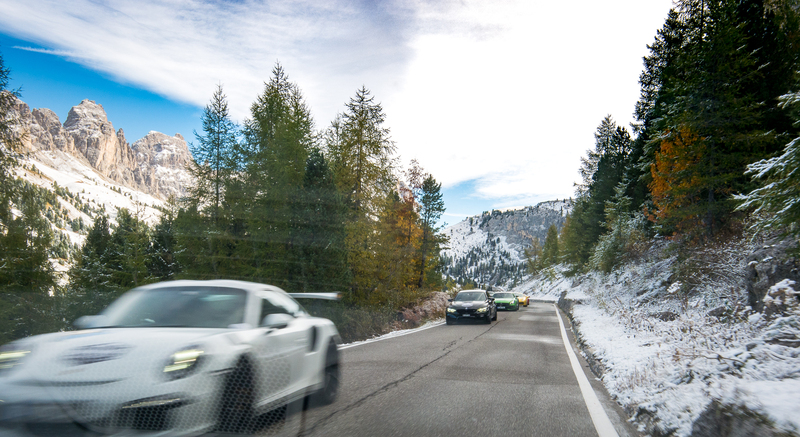 But if you want to get a sense of them in the shortest time possible, head to one of the range’s higher passes, both literally and figuratively high points of the Dolomites. 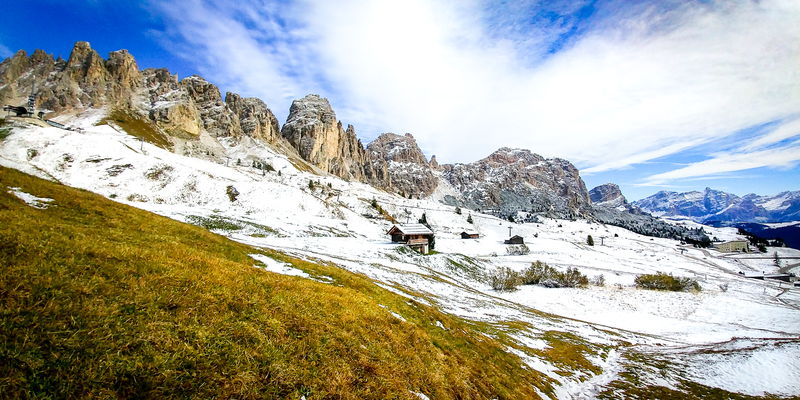 Three of the most popular are Passo Sella (Sella Pass), Passo Pordoi (Pordoi Pass) and Passo Gardena (Gardena Pass). 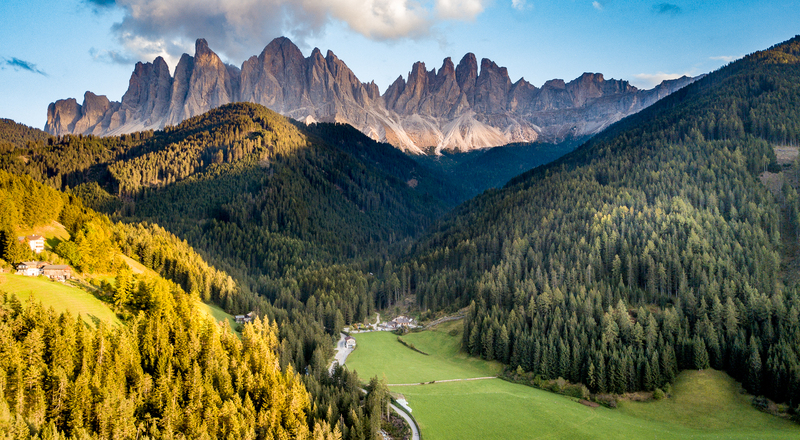 With Passo Sella, you can look out on a lush valley beneath you. 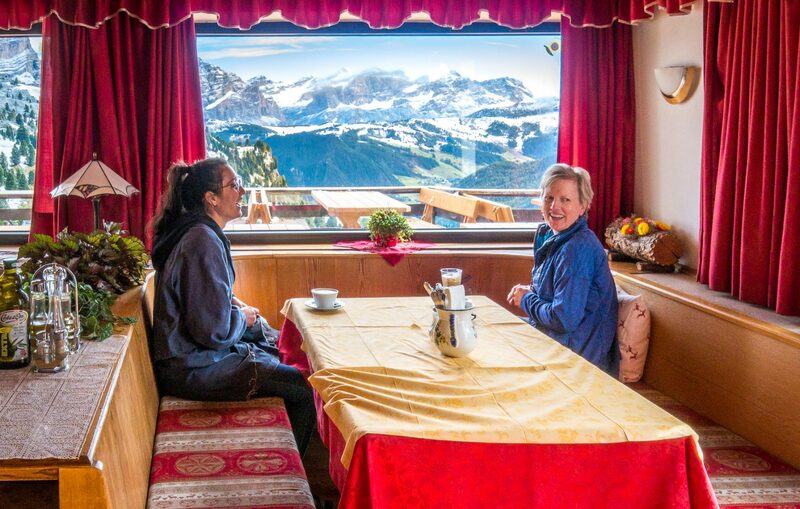 With Passo Pordoi, you can take a cable car up from the pass itself getting even higher to Sass Pordoi where you can hike, eat or just enjoy the view. 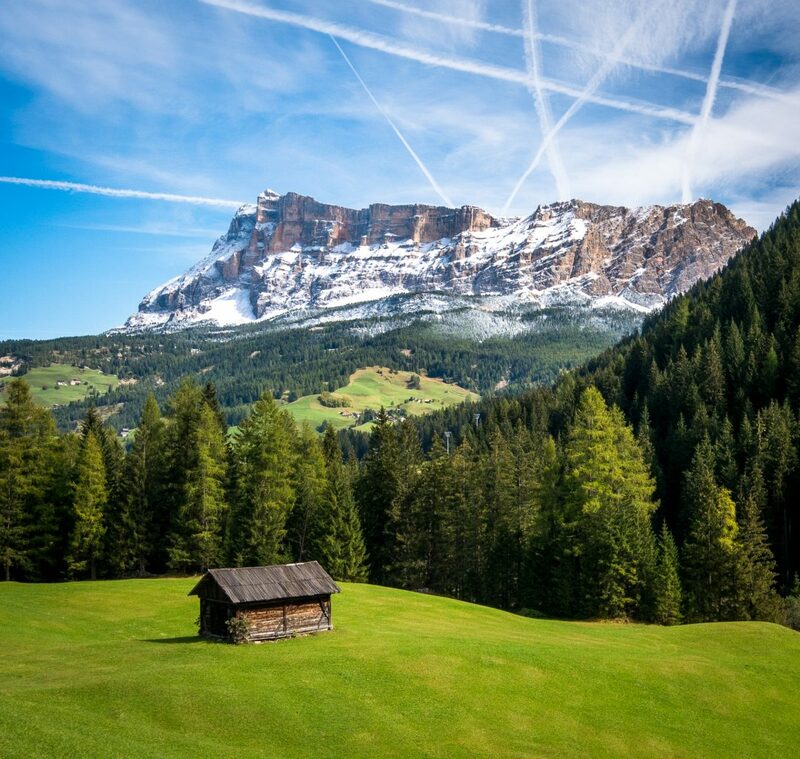 Any of these will provide an incredible vista of the surrounding mountains and give you a clear sense of why the Dolomites are so special. But Passo Gardena, is less visited. As such, once you get out of the main parking/overlook area, you can enjoy spectacular views all to yourself. 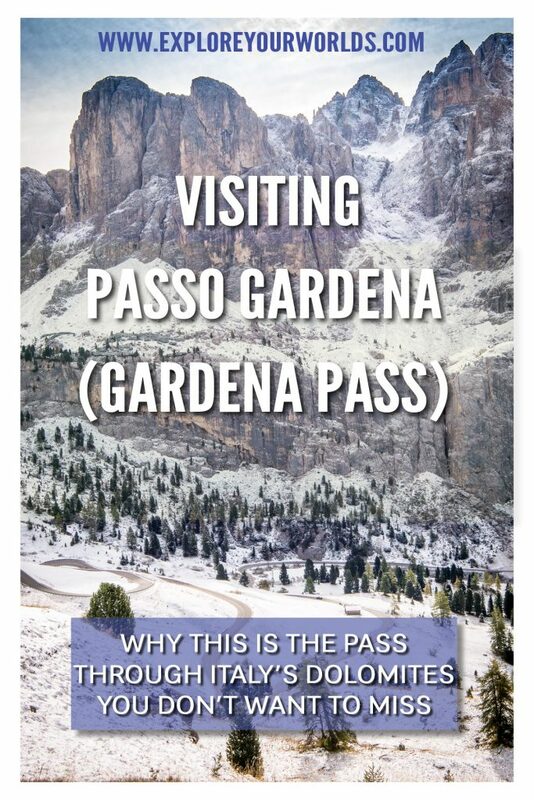 In addition, Passo Gardena (which I’ll refer to as Gardena Pass from here on) serves as such an excellent exemplar of the Dolomites because it lies near the center of the range. You can’t get to it without beholding other enchantments along the way. And when you arrive, it feels as if everything else has simply been a foretaste to entice and intrigue for the view ahead. Here are some other factors that make Gardena Pass stand out. First of all, you experience sheer awe. It doesn’t matter what type of traveler you are, the vastness of stone around you and the dramatic views below you leave you in a state of wonder. I’ve seen incredible mountain ranges around the world, but on the day we visited, with contrails above crisscrossing the blue sky after a snowfall the day before, I can only describe the scene as stunning. On the well-maintained road to Gardena Pass, you sometime encounter road rallies like this group of sports cars seen through our windshield. You also experience the surprise factor. We drove up from the west, driving past the ski towns of Ortisei, Santa Cristina and Selva di Val Gardena. The views through each of these are magnificent so you think, “Well, that was lovely,” and you assume the best is behind you. And then, you navigate your way up the snaking (but well-maintained) road and you realize how wrong you were. By the time you reach the overlook at Gardena Pass, you’re a bit numb from sensory overload. In addition to the grand vistas, Gardena Pass affords some up-close interests as well. Just out of the parking area, you can hike up to a small church and past weathered wooden huts, each with its own personality. Numerous trails radiate from Gardena Pass, both short and long (the pass is part of the Alta Via 2, one of several multi-day hikes through the Dolomites where you stay at refugios – mountain inns set up like hostels, usually with shared bathrooms and dormitory-like rooms – along the way foregoing the need for carrying tents or food). In the winter, these ski lifts carry skiers from all over Europe to the runs above the pass. 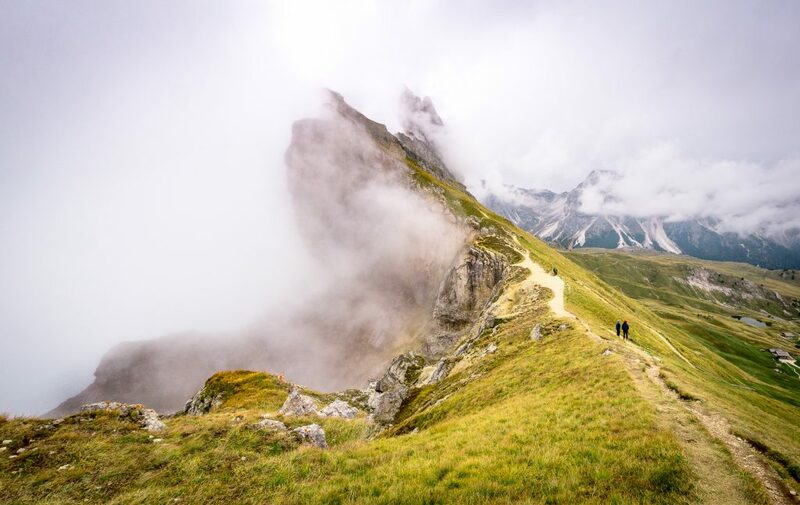 In the summer, trails lead out from here to points throughout the Dolomites. The one downside of coming in October when we did is that most of those refugios close at the end of September and many of the chair lifts or smaller cable cars aren’t running. Thus, you’ll have to hoof it a bit more for a longer hike since you won’t get the shortcut of the cable car. But even a short hike in any direction provides additional views and an opportunity to behold this beautiful scenery all by yourself. Gardena Pass was for us (my wife, son and daughter-in-law) one of those magic moments on a trip. You don’t expect it. It completely wows you with beauty. And it provides you the opportunity to not just observe nature at its finest around you, but to take time to contemplate it and enjoy it in a manner that personally brings you joy. Every type of traveler (you can learn what type you are by taking this quick Traveler Type Quiz) will find something of value, all in this one spot. For example, you can take it in on the immediate level as my wife and daughter-in-law did. They observed the view outside then, because they weren’t prepared for the colder temperature of the pass, headed into the lodge near the lower of the two parking areas. There, as Connecting Travelers, they had a wonderful conversation with the multi-lingual couple in the gift shop followed by a delightfully warm respite, sitting by themselves in a secluded area of the restaurant in front of a large picture window, knitting and crocheting (transportable hobbies useful on long car rides), sipping Italian coffee and hot chocolate and simply enjoying each other and the view. You can also go deeper in your experience of Gardena Pass as my son – a Creative Traveler – did, sketching the magnificent view from various perspectives. Or you can do what I (more an Adventurous Traveler in this place) did and explore, physically taking in as much of the scene as possible. I hiked all around, made photos and continuously marveled at the views in every direction. In short, we all encountered the same place. But we each came away with something personally meaningful. Places such as Gardena Pass make that possible. They stun you with an oversized beauty, which then opens you to the whispers of your own longings. That’s the power of awe. The marvels you witness before you stir emotions within you, ones most of us rarely feel. The good news is, there are no right or wrong ways to process it. Just feel it. And be grateful for places such as Gardena Pass which, in our distracted and jaded world, still have the power to capture our attention and our hearts. Descend several hundred meters from Gardena Pass and the temperature and colors change dramatically, but the magic of the Dolomites remains. This is on the east side of Gardena Pass on the road to Cortina.